South Korean manufacturer Samsung already started rolling out the anticipated Android 4.4.2 KitKat update for its Galaxy Note 3. Owners in Europe and Asia have reportedly been able to pull the update down since January 24th. American owners using the international variant of the smartphone may be able to receive updates anytime soon but those who bought units from carriers may still wait when their service providers will release the update. 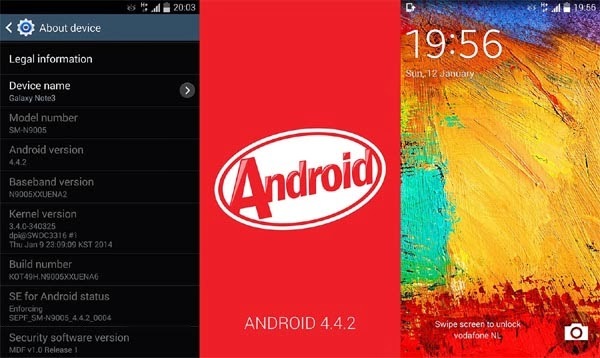 Samsung Galaxy Note 3 (SM-N9005) now runs Android 4.4.2 KitKat. As of now, there are no updates coming from the Big Four (Sprint, Verizon, AT&T and T-Mobile) as to when KitKat will be made available for their subscribers. But as far as history is concerned, it would take just a few weeks for the new updates to be made available in the U.S. from the time they were released in other regions in the world. The Samsung Galaxy Note 3 with Qualcomm Snapdragon 800 (SM-N9005) and Exynos 5 (SM-N9000) reportedly received updates together covering a broad spectrum of users across the region. Performance improvement is the main focus of Android 4.4.2 KitKat update as Google did a good job in minimizing the use of memory (RAM). Aside from that, the responsiveness and fluidity of the screen have noticeably been improved, too. It is a transition from the previous version, Android 4.3 Jelly Bean, so there is a bunch of new features, services and functions users would surely appreciate. Some of the things worth mentioning are the capability of KitKat to boost the multi-tasking function of the Note 3. In short, it would make your smartphone even smarter. However, there is bad news. Samsung said earlier that the KitKat update will not support third-party accessories such as covers or skins. So, if you are fond of buying third-party cases for your phone, you might want to stay away from the update unless you want your phone rooted. In a nutshell, the new update brings a lot of good perks and improvements but something has to give in especially for owners who want to dress up their phone more often. It's up to you to choose which of these weighs heavier for you.